Genius released the Traveler 9000 BlueEye Tracking Mouse, a new 2.4GHz RF wireless peripheral with BlueEye tracking technology. The mouse has a 1200 dpi optical engine and has a very small Pico USB receiver. It will be available in retail stores for $29.90. 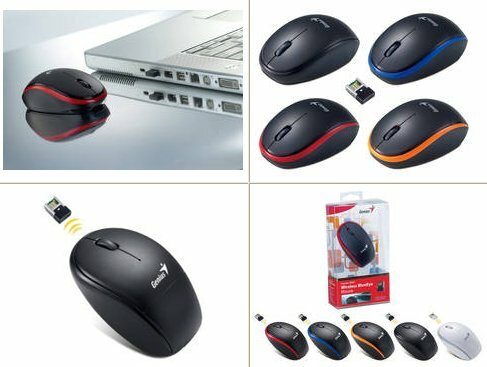 Genius, a leading manufacturer of computer peripherals, is pleased to announce that their Traveler 9000 BlueEye-tracking wireless mouse is now available for purchase in the USA and Canada. Available in five colors and designed for either hand, the Traveler 9000 has a very responsive 1200 dpi optical engine and BlueEye tracking technology that allows it to work on almost any surface, including marble and glass. It connects to notebooks and desktops using a wireless and anti-interference 2.4GHz RF frequency via an extremely small Pico USB receiver. With its simple and stylish design as well as exceptional features, this new edition to the Traveler series gives you high-quality computing control. Enjoy worry-free movement with the Genius Traveler 9000 since the USB receiver is so small it can remain plugged in when you move around the office, without fear of bending or braking. For further convenience, a Stick-N-Go mount is available so you can stick it to a notebook for easy transport around offices and at homes. There is also a storage compartment for the Pico receiver and Stick-N-Go mount beneath the top cover as well as an on/off switch on the bottom to conserve battery power, making this mouse ideal for traveling. You get a choice of five catchy colors: black, blue, yellow, ruby, and limited-edition snow beige. One AAA alkaline battery is included so that these mice can be used right out of the box.